Craft Kits and Partz Priced for Resale! A special section just for crafters selling their wares at shows. 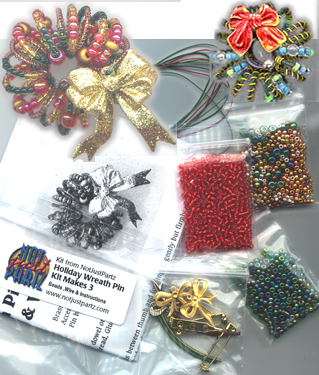 Perfect for craft shows, flea markets, fundraisers, theme charms bundled with stretchy bracelets and earwires, We introduce charm packages. We're also offering abbreviated kits priced just for resellers. Each Kit makes 6-wreaths NOW with bigger bows! Make holidays a treat with this fun and enjoyable kit! This tiny wreath, when complete fits on your lapel or can easily be a pendant. You add the enclosed pin back or create a hook for hanging. Great office gift! Made from wire and glass beads, this little jewel fits almost anywhere, can even be used for a dollhouse miniature! The deluxe wreath kit comes with enough materials to make 6 wreaths and has fabric and glitter bows. Kit descriptions use, but do not require the Twist 'n' Curl tool. Alternative methods are described for those who already have a wire wrapping tool or something similar. Save 30-40% with our Workshop/Party pricing! Bow, Angel, Dragonfly? Top your Gift with another Gift... presenting the Giftopper Kit! Take a look at our "charming" Holiday Charms.